The good people of Criterion deserve a hearty hand for their new edition of Franco Roddam’s 1979 musical drama Quadrophenia, based on The Who’s 1974 album, a “quadraphonic” rock opera about Jimmy (Phil Daniels), a revved-up, scooter-riding young man who weaves his way–with great intensity–through working class London’s mid-Sixties wasteland of Mods and Rockers. 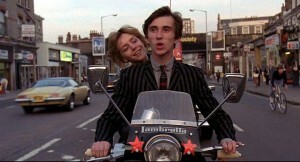 Phil Daniels takes Leslie Ash for a spin in Quadrophenia. A well-conceived, appropriately rough period piece boasting solid performances (Sting and Ray Winstone are excellent in two of their earliest film roles) and an outstanding soundtrack, Quadrophenia has become a respected and, in some circles, much loved cult piece. Fans of all stripes will be pleased with Criterion has done with the film here. The music is the magic in Quadrophenia, and the Blu-ray features a new audio mix of the tracks that Who composer Pete Townsend originally set out to present as a four-channel, quadraphonic recording. (Hence “Quadrophenia,” for the four channels, the quartet of personalities emanating from protagonist Jimmy, and the four members of The Who.) As meticulously detailed in the enclosed booklet, the mix is the result of a complex audio formula that utilized a variety of sound elements from the original album and the film’s original 2.0 stereo soundtrack elements. The resulting 5.1 surround sound mix is outstanding. Quadrophenia is not a traditional musical, what with the hefty selection of classic source music from such period artists as James Brown and The Chiffons along with all the Who cuts. But it’s all integrated with obvious care. The Who numbers, in particular, are modulated for maximum power (the gut-busting “5:15″) or subtle distinction (“I’m One”) whenever the mood calls for it. Of the fine cache of bonus features, it’s a toss-up between the old and the new. There’s an informative new commentary by Roddam and and director of photography Brian Tufano, as well as recent interviews with producer Bill Curbishley and Who sound engineer Bob Pridden, who discusses the new mix. The archival stuff, meanwhile, includes awesome B&W clips of mods and rockers from the we’re-so-cool mid-1960s French TV show news show Sept jours du monde, along with a vintage interview with Townsend (who is genuinely cool). Great stuff. Overall, another outstanding Criterion Collection presentation of a not-so-Criterionish film that, yes, deserved it. That Criterion gang really knows how to pick’em, and how to present’em.